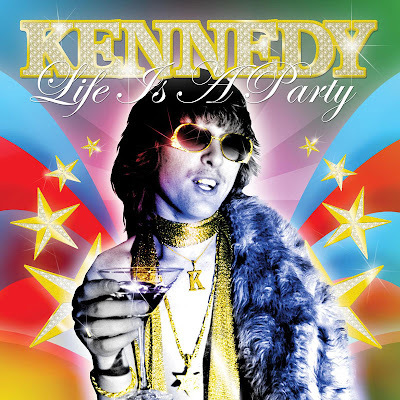 Singer/songwriter Kennedy released his album, Life Is A Party, this week, May 19. 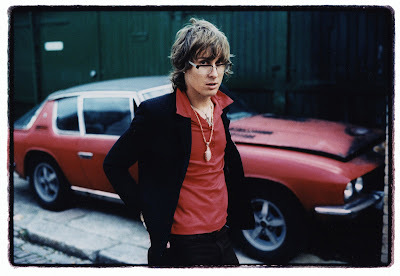 The record is filled with electro trash and retro 70's sounding pop songs. I know what you're thinking, "QNYC, you don't generally go for that kind of stuff." True, but sometimes I do. Upon first look at the album cover, my first thought was, "Oh hell no! I'm not going to like this!" But, I gave it a listen. The first song "Karate" was ok, I liked the music well enough but the lyric didn't particularly do anything for me. I thought, so far so good, nothing horribly wretched happening to make me bail before listening to the rest of the record. Then we get to the second song, the insanely catchy "John & Yoko" which features vocals by French singer Yelle. To me, this is the standout track on the album. It's what I would call a summertime song. You know, those songs that seem to catch on like wildfire in the summer and has everybody and their mama playing it. Other songs that caught the ear, "Going Insane" and "Oh Yeah." "Your Mama" gets an honorary mention. Why? For being somewhat catchy but, mainly for the sheer fact that the video is an H.R. Pufnstuf/Sid and Marty Krofft, 70's, Saturday morning acid trip gone awry piece of reasonably delightful cheese. I mean that in a good way as I love a good piece of cheese. If you're not old enough to remember those delightful Saturday morning shows of questionable enrichment, search them out. But, in the meantime, check out the "Your Mama" video and witness it for yourselves.